The following timeline was taken from A Time Line of Sackets Harbor History (page 2), Fullfilment of the Remarkable Prophecies Relating to the Development of Railroad Transportation, plus a lot of newspaper research by Richard Palmer and Bob Brennan. Richard Palmer notes that the railroad picture, found in the Time Line above, represented as the SH&E railroad station in Sackets Harbor is actually the CW&SH station, as the train is a New York Central local out of Watertown. Most, if not all, of the quoted newspaper articles are due to Richard Palmer's diligent reading of old newspapers. Chartered - $600,000 capital as Trenton & Sackets Harbor R.R. Intended to connect Trenton, N.Y. with Sackets Harbor. Directors: James Hough, Herman Terry, Luther Goitteau, Elisha Camp, M.J. Stow, Thomas S. Hall, Jason Fairbanks, Platt Williams, Ashley Davenport, Chester Buck, Samuel Allen, Noah M. Harger, Arphaxad Loomis. Thomas Stetson of Boston would build the road for $150,000. Re-surveyed by Calvin Brown; new builder, Barker & Hoes. We find in the Sackets Harbor Observer, an article upon the subject of a Rail Road from that place to Pierrepont Manor, connecting at the later place, with the Watertown & Rome road. this subject has been agitated before, but has been suffered to rest. The writer of the Observer says that the road will be built, and argues, that it will be a good investment, connecting the main line of road at Rome, with a good Harbor on the Lake, a distance of only sixty-nine miles. We regard it as a fixed fact that the Watertown and Rome rail Road is to progress steadily to completion, and that it will, in the end, prove a good investment. The Sackets Harbor and Ellisburg road (above referred to,) will, instead of impairing this, bring an accession to its business, especially at this end of the line, and we hope that also may be built. In connection with this subject we may also state that a project is on foot for building a Rail Road from Oswego, to connect with the Watertown and Rome Road, at Williamstown, 30 miles from this place. We are not aware that any movement has been made for this beyond "talking it up," but we do not regard it as at all visionary. The distance from Oswego to this place via Syracuse, is we believe, 75 or 75 miles, while by the Williamstown route it would be only about 60 miles, effecting a saving of 15 or 16 miles in all travel from Oswego to Rome and places east. This with the present amount of business, and what may be anticipated in the future, will be of no small moment to travelers and forwarders. Gazetteer of the State of New York by Franklin B. Hough, published in 1872, states Sackets Harbor & Ellisburgh Railroad incorporated April 19, 1850, opened June 1, 1853. Re-organized as Sackets Harbor, Rome & N.Y. Railroad, March 30, 1860. The iron is laid down to the outskirts of our village, and the steam animal has several times been near enough to send his peculiar screech over the town. Those who have so long doubted (and not without reason, on account of repeated delays,) the advent of the Railroad car to our town may now be assured that the "Critter" has actually snorted right in our faces, to the no small amusement of the old people and little children. To our neighbors who are sometimes a little skeptical on such matters, we wish to impress the fact that the Steam Horse has actually had a snuff at the pure waters of our bay, and though his visits are net yet quite regular, but like some fond lover, he will be pretty sure to renew his visits as soon and as often as convenient. The recent wet weather has somewhat retarded the work on the Sackets Harbor & Ellisburgh Rail Road, but every exertion is used to complete it for the running of the cars through the water, and the Steam Horse makes his visits now every evening, every thing being in readiness for the Engine House just outside of the village. We understand they ran over a cow at Smithville, on Saturday last, a pretty good beginning. 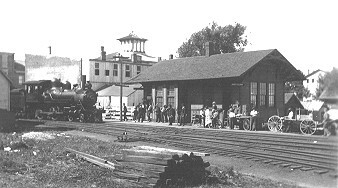 It is now stated by those posted in such matters, that the cars for passengers and freight, will commence their regular trips on the Sackets Harbor & Ellisburgh Rail Road, on Monday the 23 inst., and will make regular trips in connection with the trains on the Watertown & Rome road, passing each way twice daily, as soon as their arrangements can be perfected. The road is said to be in pretty condition for a new road, and has been undergoing the finishing up process by the aid of the gravel train for some weeks past. A good deal of confidence is felt that there will be no hindrances to the running of the regular trains after this week. The Locomotive (weighing 22 tons, the "Sackets Harbor,") Baggage and one passenger car, have been made for this road, and are said to be as good as can be found in the State; so that the running will be commenced in a manner favorable to a successful result. The running of this road, so delayed by obstructions unforeseen and difficult of removal, will be hailed with great joy, and all are sanguine of its doing a good business. The grading and rock cutting through the village, was finished up last week, having been going on just six months, and a pretty hard work it has been. Much work doubtless remains to be done, but the running may now be commenced, a thing long looked for with great anxiety by our citizens. The SH&E begins service. At Sackets Harbor, the railroad connects with the Ontario and St. Lawrence Steamboat Company. At Pierrepont Manor, it connects with the Rome, Watertown & Ogdensburg Railway. The cars on the Sackets Harbor and Ellisburgh Rail Road, commenced their regular trips on Wednesday morning last (May 31). They form a connection between the trains on the Watertown and Rome Rail Road and the steamers here, both up and down the Lake -- making two trips each way, every day. The boys took it into their heads to celebrate this advent a little by firing a few guns. The arrival of the steamers Ontario and Cataract, at the same time, with the screech of the "steam animal," the ringing of the bells, &c., made quite an animated scene for Old Sackets. The Cars on the Sackets Harbor & Ellisburgh Rail Road are now making their regular trips between Sackets Harbor and Pierrepont Manor, connecting at the latter place with the trains on the Watertown and Rome Road, and with the Lake Steamers, at this place. They have but just got under way, and as yet, very little public notice has been given of their running, still they are doing a business that equals the expectations of the friends of the Road, and leads them to expect a good business both in freight and passengers. Arrangements abroad are yet to be made, and until such is the case, no great amount of business can be expected, but no one despairs of business as fast ad the company are prepared for it. They are getting ready their extensive dock and buildings, and will have every facility for doing business soon. The new Locomotive "Sackets Harbor," has arrived together with one splendid new passenger car, built at Springfield for this road. In consequence of the road not being thoroughly graveled and settled. the new Engine, which is a heavy one weighing 22 tons, will not be used for the passenger train for some days, the passenger train in the mean time being drawn by the "Chicopee," a lighter but very good engine. The trips thus far are made with commendable promptness, and the time for a new road is good. We notice a general disposition on the part of our citizens to patronize the road, and already several excursion trips are being talked of to come off soon. Since writing the above, we have passed over the road, and find the track much better than we expected. The time made was good, and every thing seemed to operate admirably, much better we thin, than most new roads, before arrangements are perfected. We spent the day very pleasantly in connection with a few friends from our village, enjoying an excellent dinner at the Pierrepont Manor House, kept by Mr. Mason. We would suggest to our citizens, that they may have a very pleasant trip over this road, and what is better, a good dinner at the Manor, returning in time for their evening recreation or business, as duty or pleasure leads them. Try it, patronize the road, form new acquaintances, and make new friends, since they are brought within an hour's ride of you or less. The fire department of our village made a trip to Pierrepont Manor, on Saturday last, passing over the Sackets Harbor and Ellisburghh R. R., accompanied by the fire engine, which was placed upon a platform car, and beautifully decorated with flags and flowers. The company was in full uniform, and made a very pretty appearance, and we learn, enjoyed themselves finely. A band of music was engaged for the occasion, which added to the interest and pleasures of the excursion. A large number of our citizens accompanied them, and we learn were all treated to an excellent dinner by our friend Mason, at the Manor House. We would here express our thanks for the invitation kindly extended to us to accompany them, but which we were compelled to decline. The publisher of this paper Mr. J. D. Huntington was along, and can speak of the trip as it deserves. A large quantity of rock was thrown out at a blast in the rock cutting near the R.R. Depot, in this village, on Tuesday last, throwing pieces of several pounds weight, some 15 or 20 rods. Several of these pieces struck the deck and rigging of the schooners Pierrepont and Church, lying at the dock, passing through the deck or whatever they came in contact with. The crews of these vessels were about the decks loading, and a great number of persons were standing upon the docks and along the track; but no one was hurt - an escape that seemed almost miraculous, as the rock fell like hail stones all about them. The report was equal to a "nine pounder," and the execution in the rock as great as it was hazardous to persons in the neighborhood. It is almost every day's report that persons wishing to come to Sackets Harbor from the east, go to Watertown because they can get no information in regard to the Sackets Harbor & Ellisburgh Rail Road. It is but a few days since that two ladies sought information of the best way of getting to this place, and were told by some one that they must go to Watertown and take the stage, which they did. This gave them a ride some two miles more by Rail Road, and ten miles in a crowded coach over a rough road, more than necessary, to get here. Of course no responsible or decent person would mislead strangers, and much less ladies travelling alone, but still this is practiced almost every day, and hundreds are imposed upon by persons interested in that road or at least apparently in the interest of that road. We expect that agents and runners will work for the interest of their road, but it would seem that at Rome some persons might be found that should know that two trains a day each way are running over the Sackets Harbor road, and that persons coming to this place should leave the Watertown & Rome road at Pierrepont Manor, and take the cars for this place, which ae always in readiness on the arrival of the easern trains. The public may be mislead for a season, but, with all the knavery and misrepresentations practiced so successfully now, travelers will by and by find out their best route. It is true that a responsible (?) citizen of Watertown said at Albany one day last week, that the cars on this road run two days without a passenger." If necessary the name can be given. These misrepresentations are of frequent occurrence, but generally by persons of no responsibility, and entitled to no credit or attention. Amusements. - As the Oswego City Firemen are to spend tomorrow (Friday) with the Firemen of our village; and we are to have a call from the combined Circus and Menagerie, we will undoubtedly have a lively time of it in our little "Seaport town." In consideration of the above amusements, the S.H.& E. R.R. Co.., have issued half price tickets for the accommodation of visitors from abroad. The day will, no doubt, be a very pleasant one, amply repaying our friends from the country, for their time and money spent with us. We would call the attention of our readers to the advertisement of a new map of this county, published by J.B. Shields, 17 and 19 Miner St., Philadelphia. To those who have already seen it, commendation is unnecessary, the map itself contains the highest guarantee of its accuracy and beauty. For the benefit of those who have not seen it we would say that the map is very large, about 50 by 54 inches, handsomely colored and mounted on rollers, and giving from actual surveys the boundaries of all the towns, the course or location of every public road - the names of almost every farmer or landholder lying on the highways together with plans of almost every village showing streets, &c. &c.
The border of the map is very handsomely ornamented with lithographic views copied from daguerreotypes of public buildings and private residences in various parts of the county. A fair portion we notice of buildings in this place and vicinity are represented. The contrast between this and the last map we had of the county previous to the publication of this is indeed striking, the once covering about 4 superficial feet; while this covers over seventeen. It will unquestionably be many years before another map of the county will be published, and thus every one will see the importance of securing a copy, during the limited time they are offered. Chairs - 500 per mile - weight, 12 to 16 lbs. States the railroad had 1 borrowed locomotive, weighing 16 to 20 tons. Consist of passenger train was 1 passenger car; 1 baggage car and 3 freight cars. Passengers charged 3 cents per mile. Line closed October through February except for an occasional freight movement. Reorganization of the Sackets Harbor & Ellisburgh R.R. - Mr. Searles, member of Assembly from this district, has, we notice, introduced a bill into the Legislature for the reorganization of the Sackets Harbor and Ellisburgh Railroad Company. Preparations, we also understand, are making to put this road in running order as early the coming summer as possible. Re-organized as the Sackets Harbor, Rome & N.Y. Railroad (re Gazetteer, above). Sabbath School Celebration at Belleville. - The several schools uniting in this celebration will meat at the Fair Ground in Belleville, where ddresses will be delivered by Rev. R. R. Kirk, A. Cleghorn, J. Summerbell and others. Tables will be provided for all giving notice that they will attend, upon which they can spread and partake of the refreshments they my bring. The Sackets Harbor, Rome & New York R.R. will leave Sackets Harbor at 8 A.M. going south, and Pierrepont Manor at 9:15 A.M., going north. - After the exercises at the Fair Grounds, an excursion will be made to Sackets Harbor, at which place they will remain one hour, returning to Pierrepont Manor at 5 P.M. Tickets for the excursion are only 10 cents. (Excerpt of article concerning a large Sunday School picnic at Sackets Harbor on July 4, 1860). The Excursion. - at 2 1/2 o'clock the warning note was given that the train was ready for Sackets Harbor. In a short time fourteen cars were loaded with as many hundre happy children and their friends. To help break up the celebration, reports had been circulated that "the Road was unsafe;" "that we would get our bones broken," &c. Now we were about to try it, and the multitude that went showed that these reports had little effect upon them. All ready with banners flying, and music playing - by two Bands, and that of Belleville now added, - we started in fine style. we reached the Harbor, stated there awhile, and returned more heavily loaded than we went, without the least mishap. The Railroad is in good preparation. The Trussle (sic) work is as firm as any part of it. Seventeen cars, with as many hundred persons on, beside the engine and tender, were all on it at once, and no jar! All fear about the Sackets Harbor Railroad may henceforth vanish. Sackets Harbor, Rome & New York R.R. - The old Sackets Harbor & Ellisburgh Railroad, which has been entirely reorganized under the above title, has been repaired so far, that trains for passengers and freight are run three times a week between Pierrepont Manor and Sackets Harbor Tuesdays, Thursdays and Saturdays, arriving at Pierrepont Manor in time to connect with the first train going south on the Watertown & Rome Raiload, returning to Sackets Harbor on the arrival of the first train from Rome. Accident Report, Sept. 6, 1860 - Approaching Henderson Station, at Stony creek, Jefferson county, town of Henderson, morning train south on regular time, a man was seen on the track, with his back towards the train. The accustomed signals were given and repeated, but were disregarded, and the cow-catcher struck him when crossing a short bridge, causing him to fall into Stony cree, a dstance of about ten feet, breaking his leg. he has nearly recovered from the accident. The name of the person insured was Mr. S. Williams. The accident did not arise from carelessness of any one in the employment of the corporation. On and after Tuesday, August 14th, daily trains will run on this road, connecting with trains on the Watertown & Rome R. R. from Rome, morning and afternoon, and at Sackets Harbor with the American Line of Steamers both ways. A note states: "There are two engines used on this road, one of which belongs to stockholders of this company, the use of which has cost the company nothing." Searles is no longer president, replaced by Alcander Dickinson of Belleville. (This is an interesting tidbit from an article in the Watertown times, Feb. 8, 1919. It is a story about an old stagecoach driver, Manuel Jeffrey, who was 82 at the time. "One company of the 7th regiment was sent here," he said. "They had been prisoners and could not be used again in battle, so they were sent here for a rest. They came into Sackets Harbor one Sunday morning over the old Sackets Harbor &mp; Ellisburg railroad, one of the last things that road was used for, and they camped in the square." The Sackets Harbor & Ellisburgh Railroad Company ceases operation. At the annual election of the Stockholders of the above road, held at Smithville Hotel, June 16th, 1863, the following persons were elected Directors for the ensuing year: John Butterfield, Utica; John Thorn, Utica; George B. Phelps, Watertown; Alden Adams, Sackets Harbor; W.P. Davis, Smithville; Samuel Griggs, Smithville; C.W. Bishop, Henderson; John D. Gillett Jr., Henderson; Chester Barrett, Henderson; Green packer, Belleville; Daniel C. Robbins, new Hork. At a meeting of the Board of Directors after the election, held at the same place, Alden Adams was elected President; and W.P. Davis, Treasurer. Granted by congress - a privilege to extend a wharf from the depot, in front of Madison Barracks, to the U.S. Hospital. Agent W.E. Wright. The Sackets Harbor and Ellisburg Railroad was sold at public auction on the 15th instant to Mr. Kissam of New York for the sum of $19,600. The amount due the original bondholders was $150,000. This big and continuous snowstorm will put many in mind, who are still living, of that little branch railroad running from Pierrepont Manor to Sackets Harbor. It lay blocked for over a month, not a piece of movable stock upon it. They ceased shoveling, as it cost more for butter to cook the rabbit than it was worth, or than there was cash in the treasury . A good joke was told to the effect that, after several weeks of idleness, a New York contractor agreed to have it all clear for a stipulated sum agreed upon. A lengthy document was drawn, but in scanning it closely, the attorney who drew them had no date inserted for completion of the work, and attention was drawn to the omission and the contractor was asked for the time necessary, in order to insert it insert it in the document. "Oh, yes," said he, "let me see; well, you can insert that I positively will have the road all clear from snow and ice by the fourth of July next." We had several plank roads in those days, and another story is told of a distant traveler, who occasionally came to this section and when driving along on top of the snow drifts in the section near Black River, looked for the accustomed toll-house at a certain spot where there used to be one, but none was in sight. A black stump in the distance was all he saw and he chuckled to himself to think that the toll-house was no more. The road track took him close to what he called a stump, and when nearly opposite, it proved to be a chimney, out of which arose the toll-gatherer an demanded his toll. I never saw that keeper to verify the story.